Got a fat cat or round hound? You’re not alone. 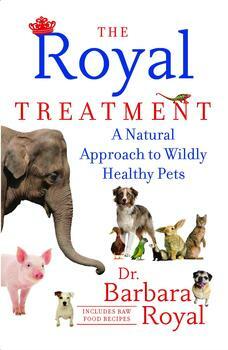 According to Dr. Barbara Royal, author of The Royal Treatment, more than half of the pets in the United States are overweight. But before you take away the food dish and install nightly jogs, be sure to read these safe slimming tips for your furry family members. There is always emotional baggage when I tell owners their pet is too fat. I try to be tactful and give hope for a thinner future, but for the sake of the pet’s health, I have to be honest. Dogs are carnivores and scavengers, and therefore they are uniquely suited to losing and gaining weight quickly. They expect times of scarcity and times of abundance, and their body mass will reflect those conditions quickly. We can use that information to our advantage by aggressively feeding less to an overweight dog to get him to lose weight fast. As long as there is fat to metabolize, canines will use it for energy. They do not have to exercise to lose weight, although it can help. The reduction of food will accomplish that, as long as they don’t have another medical reason, such as thyroid issues, to retain weight. Thin dogs feel better and handle arthritis, heart disease, skin problems, and inflammatory conditions better. Keep in mind that every extra one pound on your dog becomes—by way of some nifty calculations using physics, gravity, and a slide rule—four extra pounds of torque and pressure on each leg joint. This translates into some painful ambulation for overweight arthritic dogs. Get the weight off and your pet will be so much better, you may even be able to decrease arthritis medication. Dogs can lose weight quickly. • Chubby doggies can and should lose weight relatively quickly. U You can take emergency action to help reduce football-shaped. In six weeks, they can lose considerable weight and look like a dog instead of a not-dog. • Calorie counting is not necessary. Simply use your own informed judgment. How often is your dog pooping? Are they really losing weight? 1% weight loss in 2 weeks is probably too little. 10% in 2 weeks is more like it. • Don’t use diet foods. Just feed excellent dog food and much less of it. • Supplement hungry overweight dogs with rice cakes (plain); they are useful stomach fillers, and in this form the carbs aren’t absorbed much. Low-sodium canned green beans are also good stomach fillers with very few calories. Cats shouldn’t lose weight quickly. • Fat cats can and should take their time losing weight. • Don’t force a cat to lose weight quickly. It should result in serious illness and liver disease (hepatic lipidosis). While impatient with canine weight loss, I am resolutely patient with feline weight loss. A cat should not lose weight quickly. Once you decrease the carbohydrates, make very small decreases (maybe ⅛ less than their normal intake for a while) in food amounts. Their systems are delicate and light-touch changes are best. Cats, unlike dogs, can develop fatty liver disease from a “starvation mode” metabolism if they don’t eat every day. This is life-threatening. Feline weight loss takes time and effort. Some cats may take over a year to reach a normal weight once they are on a suitable food. This is fine. • Move food bowls to a place where the cat has to make an effort to get to it when hungry. They will be less likely to snack unless they are truly hungry. • Don’t forget to show them where the food is and make sure it accessible to them. • Feed twice daily. It’s okay to leave a small amount of the food out till the next feeding. 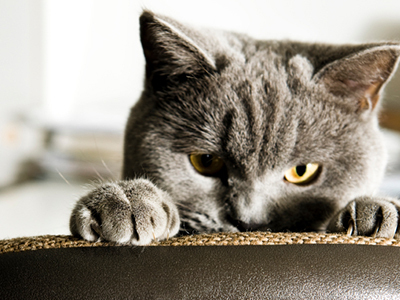 • Play more with your cat—cat dancer—type toys can pique their interest.